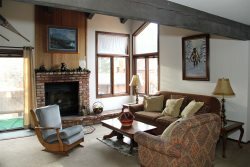 4/21: Mammoth Lakes Rental Wildflower 7 - Living Room and Dining Room. Flat Screen TV with Directv. Property Size 833 sq. ft. This unit is Pet Friendly and a charming and spacious one bedroom and one bath condo located in the heart of Mammoth on the green line shuttle stop to the Eagle Lodge Ski Area. (approx. 800 sq. Ft). This spacious ground floor unit is all one level and there are no outside stairs to enter the unit. Corner unit is bright with lots of windows to the let the light in. Fully furnished with Antiques and Beautiful Art. There is a Queen bed in the bedroom with dual control electric blankets and a Queen sofa bed in the living room. Sleeps up to 4. The unit has 2 flat screen televisions with Direct TV, 1 DVD/VCR and stereo. There is also a wood burning fireplace in the Living Room. The kitchen is fully equipped and the dining room has a large oak table. The breakfast counter also allows for informal seating for two. The beautiful complex offers a sauna and spa for your enjoyment year round and a swimming pool available in the summer months only. Outside parking. Wifi internet access in unit. No Phone in unit. Coin-operated laundry facilities in the common area near the office. TOT LICENSE 3390-WF07. Quoted Rates reflect cash or check pricing. Just a really great, well-appointed place. As others have noted, the kitchen is amazingly well-stocked. You wouldnt know this is a place that regularly hosts pets, because its so darn clean with absolutely zero odors. Just as described. Convenient to the shuttle to eagle. Well stocked! We stayed here for a great winter storm. We were able to leave our car and catch a free bus to the ski lodge only a half a block away!!! After a couple long days of deep delicious powder we were able to soak our aching bodies in the hot tub!!! Then relax by the wood burning fire place with a glass of wine! This is truly what California living is all about!!!! Everything was perfect!!! Good morning!!!! Thank you for a wonderful stay. The neighbors were all very nice. We really enjoyed our stay.The cabin/condo was so perfect for us. We got in the best powder runs of our lives!!! We will never forget this wonderful trip and our stay. Thank you so much for allowing us the opportunity to enjoy this beautiful area! And the clean new sponge at the kitchen sink was a great touch. It was funny because the last place we stayed I noticed how old the sponge was. I thought it was kind of funny. :) Have a blessed day! This place is great! I was able to bring my puppy we had dog pick up stations everywhere. The place itself is actually nicer in person than in pictures its very homey and roomy ! Check in was a breeze and so was check out. We booked last minute on the MLK holiday weekend and were thrilled with the place! Quick and easy communication left me at ease and the check-in & out were made easy. Great location and who doesnt like a real wood-burning fireplace in the mountains?! Would love to come back and highly recommend to other potential guests.